This is my first post. JB was recomended by FHB Breaktime. From what I have read on JB, there are some very experienced folks here that share their vast knoledge. We are planning a 64" x 76" shower w/bench in our 13'6" x 24" bath addition that would be similar to ADA specs. We are in our final home and want to have an accessible shower. I would like to know the best way to do this before we frame the floors. The shower area will be 2" below the floor surface. The Deflecto tool is great. Good on you for planning ahead! It's hard to retro-fit a curbless shower into an existing home, but fairly simple to build it into new construction. We like the Kerdi shower system from the Schluter company (www.schluter.com). You can use Kerdi to waterproof the entire bathroom floor, so that spills and drips will not be a problem. If you are planning to build a slab on grade home, have the concrete guys pour a recessed area where the shower will be. The recess will have to be about 2 inches deeper than the proposed drain height so that a sloped mud bed can be placed. The Kerdi mat will cover this mud bed and continue out into the main bathroom area. If your floor construction will be wood framed, have the carpenters recess shower area similarly to a slab on grade bathroom. The only difference is that you will use Ditra, another membrane from Schluter, to waterproof the rest of the bathroom. A couple of things to note: 1) You got to use the Kerdi drain fitting with Kerdi-mat. It's a given, so plan accordingly, and 2) Kerdi isn't widely accepted by some of the building authorities. Get with them early, and show them the literature. They usually come around, but you'll want to be ready to change plans before any wood is cut or concrete poured. Thanx for the reply. The floor system wil be wood framed 2 x 10 16 OC with doubles around the shower area. If we use 2 X 8 in the 64" direction that will give us a 2" difference total. When you say 2" below the drain height are you requiring a 4" total. That would mean 2 x 6. I am a 30 year cabinetmaker so this is new to me and I want to do it right. Yes, that means the floor must be recessed by about 4 inches, if you want the shower drain to be 2 inches below the bathroom floor. You can get by with less, since you can install the Kerdi drain before you connect the drain piping, so say 3 inches. The size of the joists you can use is gonna be governed by the support you have available below them, Chuck. You could use the 2x6 sections to drop the shower area so long as you are able to support them properly. You cannot, however, just pewt some 2x6 sections along the span of the 2x10 joists if they are to span, unsupported, that 14-foot direction of the new floor. 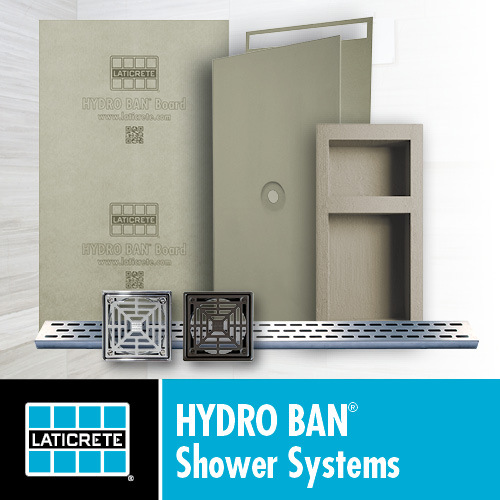 You could build the entire joist system of 2x10s at a level 3 inches below where they need to be to accommodate the remainder of the floor and raise all the areas that are not the shower. A drop of 3 1/2 inches would be easiest in that situation since you could just add a 2x4 on top of all the joists. You hafta use some care in doing this framing to avoid squeaks, and blocking will be required between the joists, at least in the upper portion. If you plan to tile the entire room, you might wanna give thought to using a mud bed in the entire room - just because you can. Masons finished. Moving and tamping compactical dirt in crawl space ( 30" clear). Start framing in 10 to 12 days. Waiting on BHAR reviaw. Thinking about using CCA lumber for joists ( 2 X 10 SYP, 16" OC, 12' 11" span) Header off shower using 2 X 8 ripped to 6 1/4. DW is looking forward to picking out tile . Deflecto will dictate. Will try to post photos but on old mac 10.1 I can only compress to 60. I'd recommend against the treated wood joists, Chuck, unless it's KDAT. Careful ripping that framing lumber. You can't rip down a 2x8 into a 2x6 1/2 and call it a 6 1/2" board of the same grade. Your building inspector will know that. Your framer should, too. You run the plans by the code compliance people with the ripped joists for approval? Don't see why. With new construction, you have the opportunity to make the Deflecto say anything you need it to. Deflecto sez 1020 for shower and 458 for bathroom area. There is a thread in the Liberry on posting pichers including a link to a freebie photo editor download, Infranview. Once you get the hang of it, most easy to reduce your pichers down to the 50kb limit without reducing physical dimensions. Although I should mention that 600 pixel size maximum, either dimension is another limiting factor. I am on a MAC 10.1 and I cannot find a MAC compatable version of Infranview. I am sure there is a way to do it on a MAC but I'm probably not holding my mouth right. I will be ordering my lumber on Monday. What do you all think of 3/4" T&G 'Advantec' for a subfloor rather than plywood? I went to the 'liberry' and they don't talk about advantech. I gues my question is it worth the price difference? Advantech is the first structural-use panel with proprietary design capacities, which are superior to the design capacities of commodity PS-2 panels. *They are used in both residential and commercial construction for floor, roof and wall sheathing applications. AdvanTech Flooring panels are used for both single-layer and sub-floor applications as well as roof sheathing. AdvanTech Sheathing panels are used for roof and wall sheathing as well as sub-flooring in two-layer systems. I use plywood. Just my preference. Start Framing tomorrow. JB's e-book sez to drop a floor use 2x8 for the shower and 2x10 for the floor(depending on span) BB Camp said 4" but you can get by with 3". New work dictates I can do whatever is required. The shower will be 62" x 76" with a monolithic bench on the 76" wall. I reckon 5/8 - 11/16 slope and 1-1/4 at pre slope drain (centered) height. What should the joists be ripped to. My thinking is 6 1/4" to give me a net 3". See my post number 7 for an opinion on ripping the joists. I just can't conjure up a reason to be ripping floor joists in new construction and it's just never a good idea unless absolutely necessary - and it rarely is. Use full-sized joist material and place them at the necessary height. Three inches of drop should be enough given your shower size if you plan to make the shower floor level with the outside floor.